† tsucchi †: SALE STILL BETTER THAN GSS. SALE STILL BETTER THAN GSS. 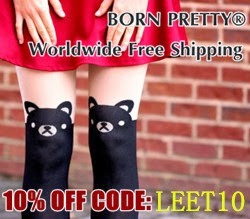 I recently wrote to a apparel + makeup webstore which you probably heard of - www.bornprettystore.com - and they kindly gave me an exclusive discount code (soooooo nice right they) that I would like to share!! Thanks dear Keit ♥♥ for recommending me this fantastic store and bornpretty's friendly collab staff Jenny for this offer!! Remember to enter the coupon code when you check out. Coming soon to the blog! !